Impression: First, I don’t really get the “upside-down” but perhaps if I keep looking at it I’ll get it somehow. It seems fine–and black for a Friday night is on point. Second, conspicuous by absence is the “Miracle League” jersey auction. A quick perusal of the promotional schedule and I don’t see Miracle League at all. Perhaps it’s TBA and will be added later. I’d hate to see them do away with that. Plus, I know there are some folks who have been collecting those jerseys through the years. 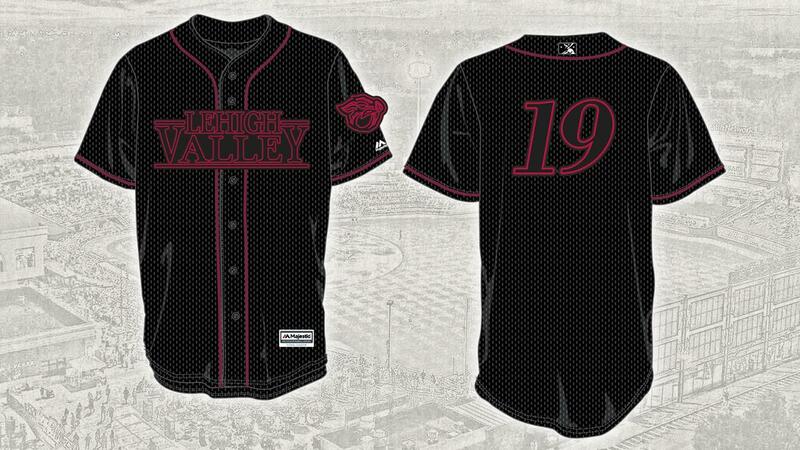 I’m all for specialty jerseys and the auctions all go for IronPigs Charities (traditionally anyway, unlike Phantoms) so there’s a good cause involved. Sometimes maybe it goes too far, but often those are the ones that generate the most free publicity, so I’ll go along with it. With the Majestic contract still in effect, they have the opportunity to have perhaps some additional control over things with respect to the designs of these shirts. If they’re willing to listen to me (yeah, right) I’d suggest they not let Majestic dumb-down the quality. Some of the jerseys in the last two years–not all of them, but many–have been of inferior quality. They’re not made well or made using professional-grade materials which is very disappointing. If you’re asking these players one step from the big leagues to wear these jerseys–even for one game–and you’re asking folks to bid hard-earned money–even for charity–then just have Majestic use something close to the real thing. It reflects better on them, as well.